Here's a look at the completed Eldar Corsair conversion I did the other day. Since I wasn't too sure of the color scheme, I decided to copy the one from Forge World. 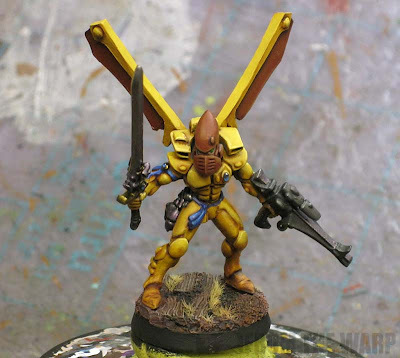 You Eldar players will have to forgive my ignorance... if anyone knows what pirate band this scheme represents, I'd like to know. As far as painting him goes, it was a little different than what I normally do. In this case, I laid down my base colors over a light grey prime and then added a series of washes until I had the color I wanted. I went a bit lighter with my base colors knowing I was going to darken them down like this. My normal approach has my trying to get much closer with my base color selection and then applying my washes selectively to the recessed areas only. 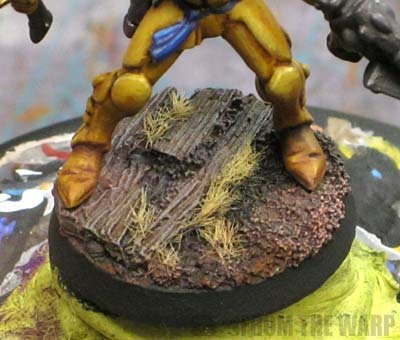 The yellow started out as GW Foundation Iyanden Darksun that was given three or four passes with GW Ogryn Flesh wash until I was happy with it. A little retouching with the base color for the "highlight" and I was pretty much done. I did go in and add a thin line highlight by adding a tiny bit of white to the base color, but it was not much and I only applied it to the very top most edges of a few armour plates. The brown was another part where I started with the base color of GW Foundation Calthan Brown and applied four passes of GW Baal Red wash until it darkened down enough and it took on a slightly red hue. I did go in with a few weathering powders to add some realism to the model. A little bit of browns and reds around his feet and on the base. I also hit the weapons and jump pack vents with a Metallic Iron to give them a subtle worn look. I will say that you should paint your gems (if you have them on a model) last. Wait until you have applied your powders and then go back and detail out your gems. That way you don't ruin any blending you do with your powder application. The base is what gave me the most trouble. It comes from Secret Weapon Minis. I have a handful of these (the Trench works) and have used them every now and then. The trouble I have is in painting them well... not with the base itself. If I were doing a Death Korps army, I'd use these in a heartbeat, but my problem is getting them to look right. I think I've sort of figured it out by giving the dirt a warm look, carrying that over into the wood planks and then highlighting them with a light grey color to help with the contrast and make them stand out a bit from the dirt itself. The grass is an added touch and I placed it in between the boards and the recessed areas. I also added a thin black wash to the cracks between the boards and the one recessed area on the base. It's hard to get that dead feel and still include enough elements on the base to make it its own thing without overpowering the model in the end. Maybe I'm putting too much effort into it and should just drybrush the thing light grey and call it a night. You know what, I may try that very thing next time to see how it turns out. Glad I caught this when I did. 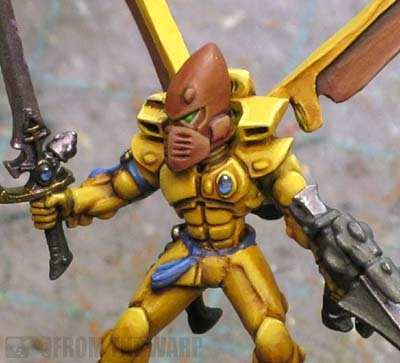 Very slick-looking conversion, pretty accurate. I'd actually recommend using the balancer from the Splinter Cannon (the little bulb hanging from its underside) and maybe some recut styrene tube instead of the Scatter Laser nodes though; those look bloody huge! According to the leaks I've seen, that scheme is from the "Sun Blitz" warband, by the by. looks great! only point of critic is the allignment of the facemask it's slightly off center if you look at the eyes. 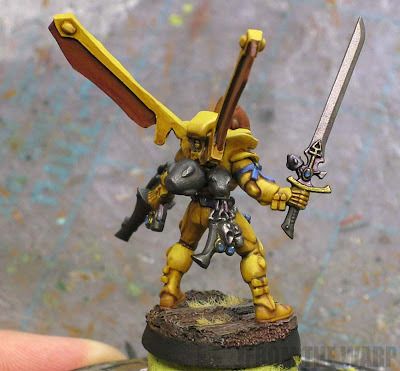 But the conversion asa whole is great and Is going to be an inspiration for my corsairs army! Impressive! The tan/brown/yellow really works for this. And thank you for the banners! Anon: It's a balance. I tried to do this one on the "cheap" as it were with what I had. I think you'er right though, maybe some refining of the parts might yield a better result. And Sun Blitz you say? I haven't picked up a copy of IA11 and I was hoping it might be in there. CJ: NUTS! It's not even noticeable until you look at that specific pic. It is slightly off like it shows. I had to get the model out of my case and look at it up close. Despite that, i'm still calling this one a win even if his head is kinda off. Figures I could mess up something as simple as that. Fayte: I was commenting while you were... you're welcome for the banners. Glad they help. Well seeing how GW can't even get their farseer models eyes to line up I think you did a fine job. The finisted piece is very nice... Now lets see a full squad. 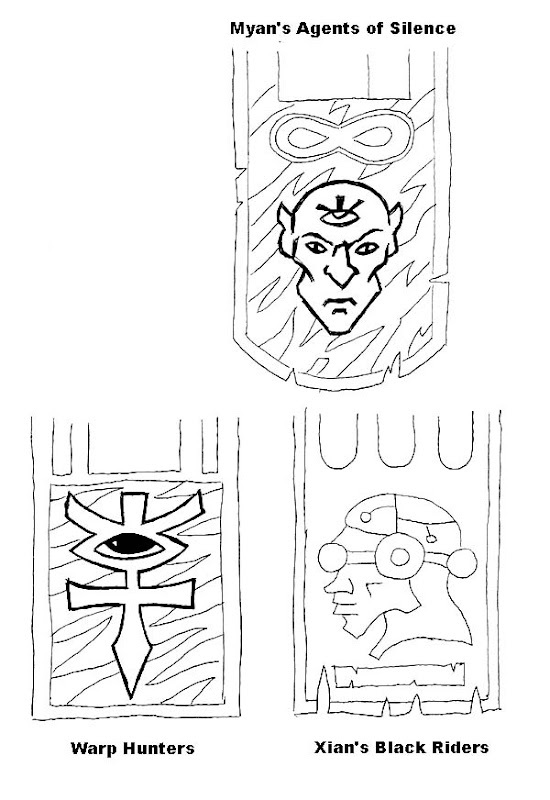 Anon: If I played Eldar maybe... if someone else does it, I'd love to see the results. Just woow, one fabulous looking mini you have there Ron! 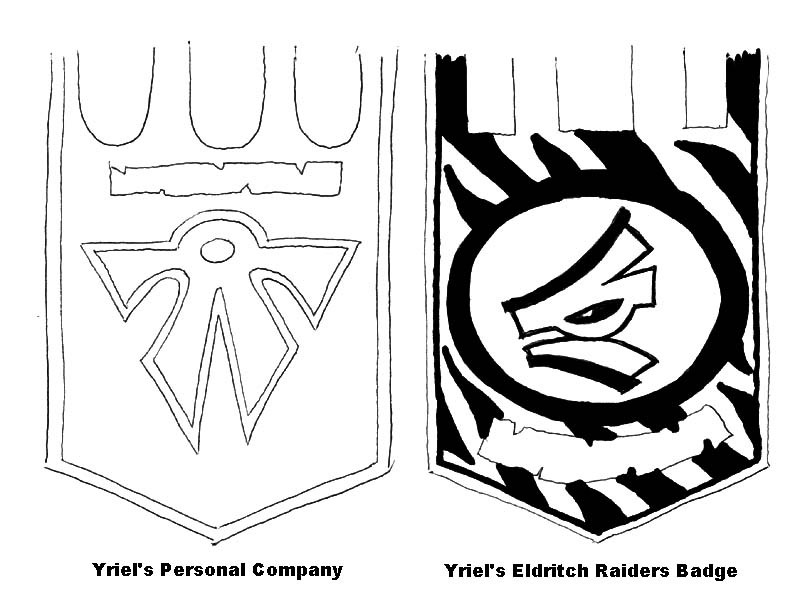 Well the colour scheme looks very similar to that of Iyandend, and of course Prince Yriel, the most famous corsair came from Iyanden, so it might be Yriel's Eldritch Raiders. SpeedyFrenchy: I've had one vote for Sun Blitz warband as well. If anyone has IA11 and it covers this scheme in particular, I'd love to know. Beautiful model you have. I love the color. Sorta harsh but still attractive. GundamFanForever: Thanks, the colors are a bit bright... I copied it from FW since I know very little about these guys and their color schemes.